Roti prata with egg is one of our favorite breakfast dish in Singapore – thus, when one of the deal coupon websites offered this deal: “Only $4.90 for Prata Buffet at Prata Planet – Includes 21 Selections of Prata, Naan & Thosai with 1 Beverage (instead of $19.90)“, I just had to buy the deal and so did about 2000+ other deal hunters. 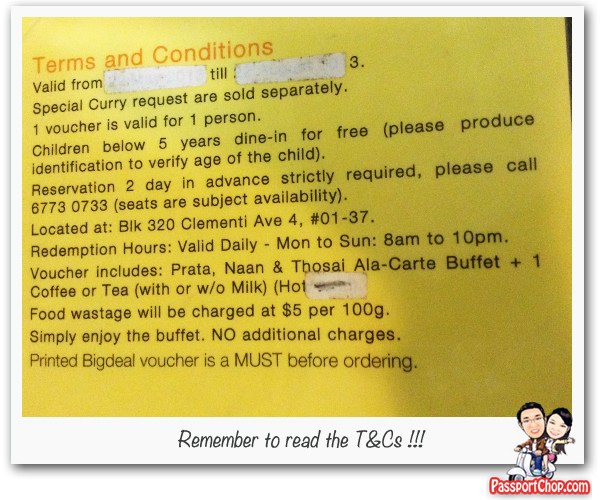 The coupon only has a 3-month validity period and requires a 2-day prior reservation by phone before you can go down to use the coupon at Prata Planet. However, the problem was that it was almost impossible to get through their phone line (67730733) – the phone line was either not connected or no one ever picked up. I guess it could be due to the high volume of orders through the deal site; what surprised me was that the prata buffet deal was still being offered at other deal sites (again chalking up thousands of orders at each site!) which only added to the already high demand for reservations at the restaurant – weekends were almost fully reserved for 2-3 consecutive months (not verified personally but this was written in one of angry negative reviews on one food review portal)! The ironic thing is that Prata Planet started to chalk up very negative reviews at various food review portals after it offered the Prata Buffet deal; from angry customers that couldn’t even utilise their coupons as they were unable to make a reservation to customers who managed to use the Prata Buffet deal and was frustrated with the service. Some comments from the latter group include the one time order policy i.e. despite this deal being a buffet, customers have only one chance to order whatever they want to eat at the buffet – with the 2-hour time limit imposed as part of the deal, this one-time order requirement seemed unnecessary and it is hard to gauge how much one can eat right at the beginning of the buffet. Anyway for us, we finally managed to call through to Prata Planet at 9.30am in the morning for a Monday evening reservation (with just 2 weeks before the coupon expired)! When we arrived at Prata Planet on a Monday evening 7pm, the restaurant was surprisingly not crowded at all and our orders came quickly and the best thing was that there was no one-time order requirement – we can order as many times as we want as long as we stay within the 2-hour time limit. We started off with a naan, thosai and prata combination (with one complimentary cup of teh tarik) – as seen in the picture below. I suspect that the one-time order requirement is only applicable for busy periods e.g. weekends (but I did not verify this personally). I think the Prata Buffet at Prata Planet is only available with coupon purchase i.e. 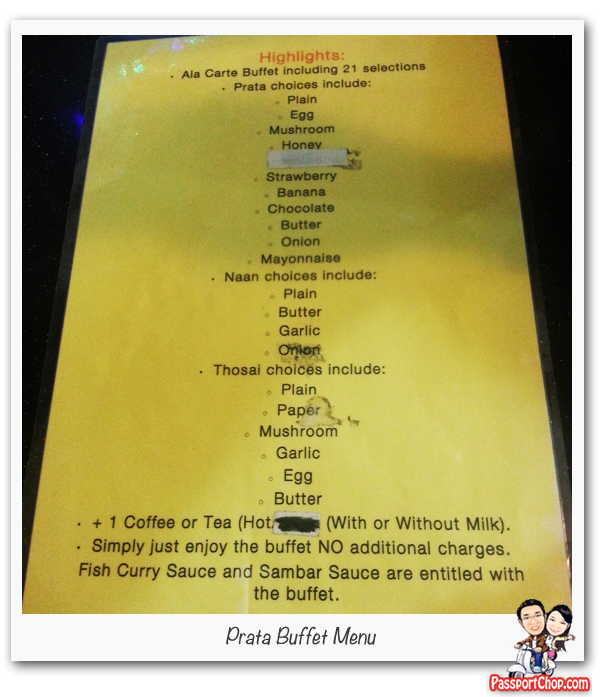 you cannot try the Prata Buffet even at the non-deal discounted price; you will have to order each prata at their ala carte price. What’s the difference between Thosai, Naan and Roti Prata? Thosai is a thin Indian Pancake and is quite similar to crepes. Thosai is made up mainly of rice and lentils crushed into fine grains. Naan is a form of flat bread and its ingredients comprise flour, yeast and yoghurt. I think the above description is not helping a lot in differentiating the three – its best left to taste – the picture above shows all three – naan at topmost part of picture; thosai below it and prata on the right side. … although it is stated as “Simply enjoy the buffet. NO additional charges”. 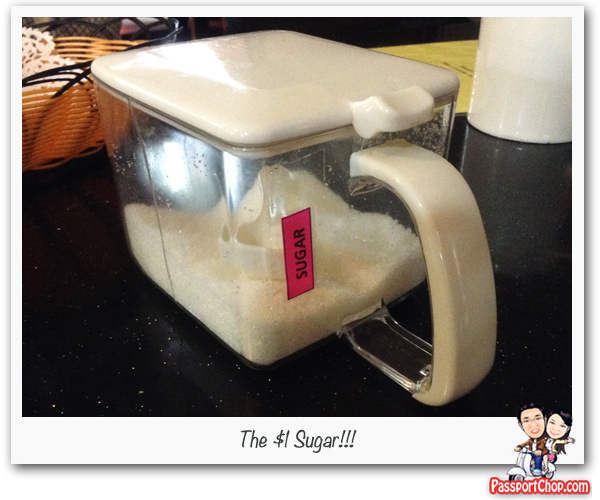 However, we were charged $1 for sugar at Prata Planet! Roti prata can be enjoyed with curry or sugar and it is sort of a given that sugar is provided as part of a typical roti prata meal but here at Prata Planet, we were only informed of the charge after we have used sugar for a few pratas – this completely caught us by surprise. 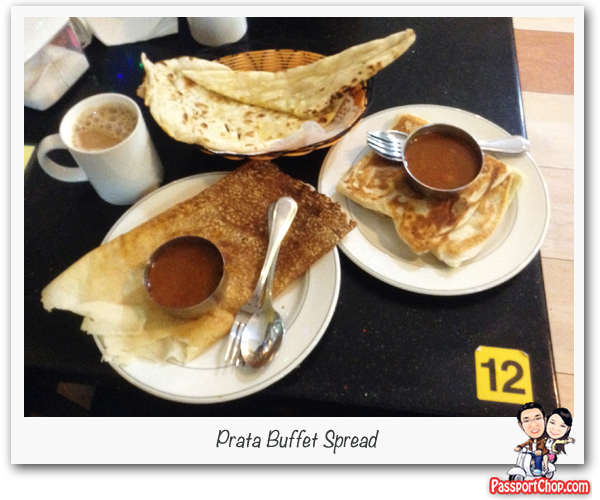 Overall, the Prata Buffet dining experience at Prata Planet was surprisingly ok (except for the $1 sugar!) – service was ok, the restaurant clean and air-conditioned! 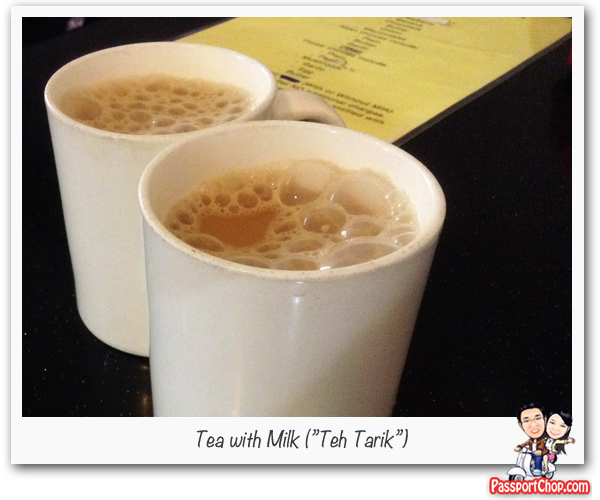 The food was quite alright – the teh tarik was really good! I strongly recommend trying the Egg Roti Prata if you are here for the Prata Buffet – very well-made; the rest of the Prata selection e.g. chocolate, mushroom, honey was ok too. 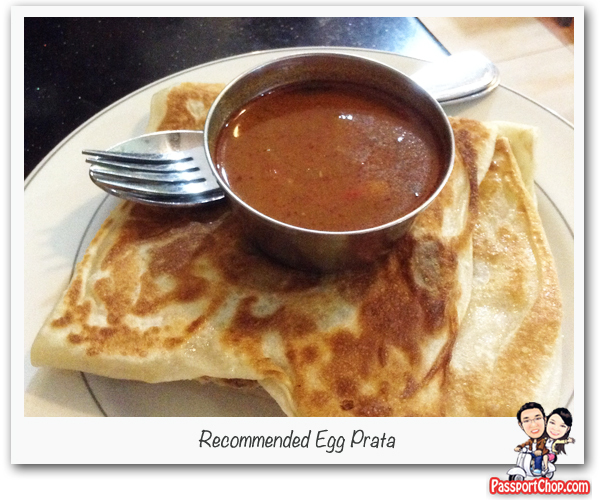 The Prata Planet is within walking distance from Clementi MRT (about 5 minutes walk) and is easy to find. 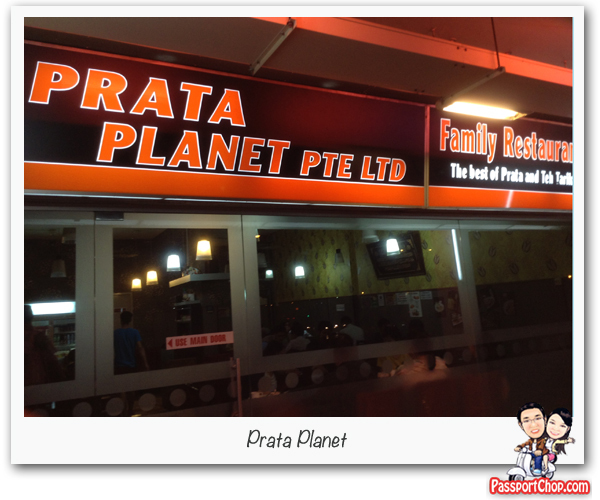 Is the Prata Buffet at Prata Planet worth it (at $4.90)? Personally, I say “Yes” if you have a craving for prata and you can finish at least 3 egg or flavored prata and a teh tarik, you will break even! 🙂 Their prata tastes ok too – order the prata and thosai; you can get quite full easily just eating naan. Prata Planet should seriously sort out their phone reservation issues and be consistent with their service in the restaurant (e.g. don’t spring surprises like $1 sugar or the one-time order requirement). If you are redeeming your prata buffet deal coupon, please note that prior (2 days in advance) reservation by phone (6773 0733) is required. You will need to quote the deal company you bought the coupon from. To secure a reservation at Prata Planet, I suggest calling early in the morning just when the shop opens. Weekend reservations are almost always full so try for a weekday reservation if you can. Remember to print your deal coupon and bring it to Prata Planet. Yoghurt thosai was not one of the option in the buffet menu. I have not tried the yogurts thosai before. Is it sour? Awesome post. Pics are very yummilious and beautiful. Breakfast is important and should be heavy(not so much oily) to start that day. It will boost the whole day.